This animal is the bulkiest and possibly Africa's most formidable bovid. An adult stands 4.5 to 5.5ft to the shoulder and weighs up to 1 tone. They are non-territorial, found in large mixed herds with a male dominance hierarchy. The buffalo’s head is broad, with a bare, wide muzzle. The ears are large and rounded, but drooping and fringed with long hairs. 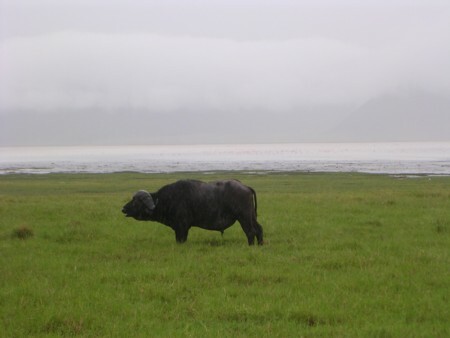 Buffaloes have poor eyesight and hearing but a highly developed sense of smell. Herds may live in open woodland, but well-watered savannas such as swamps, floodplains, mountain grasslands and forests of mountain regions are favored. Good habitat consists of dense cover like reeds or thickets but one of the major features required is water. They can survive without water for less than two days, but usually drink daily, mainly during daylight hours between noon and dusk. 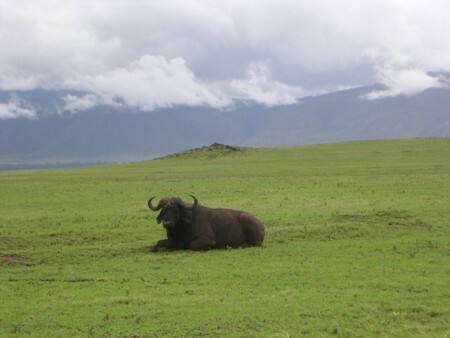 (Mloszewski 1983 and Pienaar 1969) Buffalo are mainly nocturnal except in protected areas. Old males tend to be solitary or form small groups of up to 6. 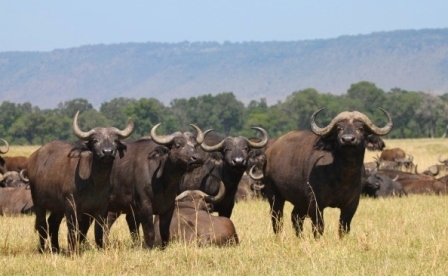 Young bulls form bachelor groups. Herds tend to use known routes between water and grazing and use salt licks to obtain minerals and trace elements. Status in males is being determined by fighting ability, which in turn depends on size and age. This dominance also determines which males will win mating opportunities with females. Females move up in rank when they have a calf at foot. High rank brings the privilege of traveling and feeding to the front and center of the herd. This is the best place for grazing and protection from predation. Low ranking members are at the back and edges of the herd and so suffer much more from predator attack. 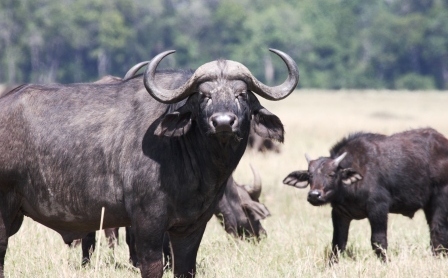 Buffaloes appear to have several calls, most of which resemble those of domestic cattle, but are of a lower pitch. A calf’s distress call will often trigger a mobbing response from other clan members.